This is a color that involves some planning. You can’t just splash it on the wall and expect to look good, If you do it right you can use black in pretty much every space in your house: bedroom, living room and even the kitchen, yes. Black paint is not the easiest to work. If you’re not careful with the paint job, after a while the walls will start to show some imperfections. To avoid that, use matte black paint. Most of people just don’t pay attention to the ceiling. If you want to stand out paint yours black. That will make it look lower and sleeker. But think first. If you already have a low ceiling don’t do it. Choose another color. Paint an entire room black won’t look very good, let’s be honest, so try to combine it with some lighter colors and fill your room with objects than can contrast with the dark tone of the walls. You’ll end up with an extremely dynamic room. If you fancy a classic style play with black and white. Another aspect that you have always to keep in mind is lighting. Make sure that the room has both natural and artificial that can give a special effect to your room. 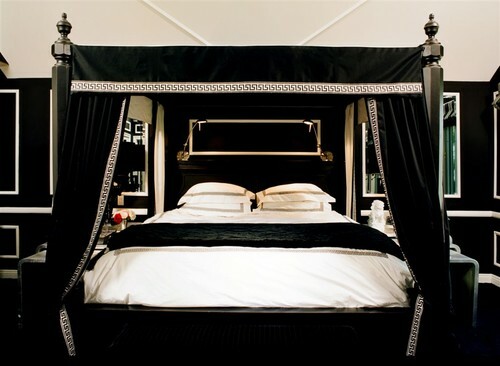 When used correctly black paint transforms your place in an open, dramatic and stylish home. If you’re the kind of person that has to try something new…go on. Buy the paint and let us know the final result.